LivCom - What is that? 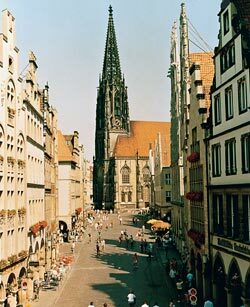 A view into the heart of Münster, with the gabled houses on the Prinzipalmarkt and the Late Gothic St. Lamberti Church in the background. 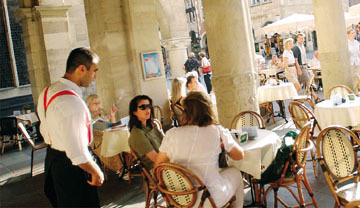 Münster has been able to call itself the city with the highest quality of life in the world since October 2004. The metropolis in Westphalia is the first German city to have won the Gold LivCom Award in Niagara/Canada and came first in the category of cities with 200,000 to 750,000 inhabitants. Münster was thus able to beat cities such as Seattle/USA, Okayama/Japan, Changshu/China, Posen/Poland and Coventry/Great Britain in its premiere in this international cities’ competition. More than 450 towns and cities from throughout the world had taken part in this competition in 2004, which is officially called the "International Awards for Liveable Communities". 53 were nominated by the event organisers – the United Nations Environment Programme (UNEP) and the International Federation of Park and Recreation Administration to take part in the final. Above all the sustained planning and the interdepartmental work carried out convinced the international jury. The title attracted international attention for Münster and curious questions, above the following one: What makes the city so liveable?